On February 17, 1996, 32 year old Mary Ellen Slane of San Rafael was killed and 14 others were injured when the deck at 2003 Franklin Street busted, sending the doomed party guests crashing 4 stories to the ground. A going away party for Troy Winkles was in full swing when the deck collapsed at about 8:30 p.m. In addition to Slane's death, the horror caused a crushed face, fractured pelvis, leg fractures, bruises, abrasions, and other massive head injuries to the guests. City Officials determined the collapse occurred because landlord Randall Nathan moved an important support beam without required permits. The case fueled antipathy against landlords in the City and caused a sensation when District Attorney Terrence Hallinan became the first D.A. in 50 years to personally try a case against a criminal defendant in San Francisco. Despite Hallinan's efforts, Randall was convicted only of two misdemeanor charges of failing to maintain a building in a safe condition and failing to obtain a permit for remodeling work. The jury deadlocked on felony charges of involuntary manslaughter in Slane's death. Nathan was sentenced to 200 hours of community service and a $1,000 fine which was later reduced to $500 when the conviction for failing to maintain a building in a safe condition was overturned because of technicality related to a court filing date. 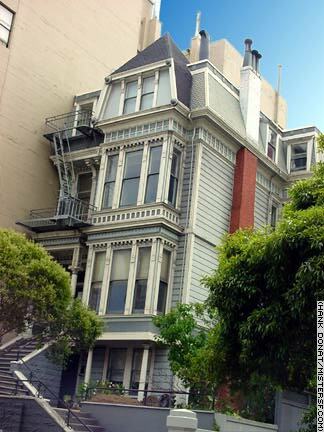 Injured guests and Slane's widower sued Randall and were awarded $12 million by a judge, one of the highest awards ever given in San Francisco for landlord negligence. A rebuilt deck can be seen from the neighboring historic museum, Haas-Lilienthal House. Haas-Lilienthal gardener Mark Niclas witnessed the deadly deck collapse.